You can also select the QuickPick option (Quick+1) and this will automatically choose a line for you. Once you have chosen your numbers, select which draw you want to play, either Tuesday or Friday, and press Submit. This will take you through to a checkout – at this stage just click Confirm and proceed to place your bet. A single line costs €2.95. A line with the DoubleJackpot feature costs €5.90. For more on DoubleJackpot please see below. The EuroMillions jackpot is capped at €190 million. However, you can select our DoubleJackpot feature for the chance to win twice the official EuroMillions jackpot amount. See below for information on how this feature works. It costs double the price of your normal line to activate the feature. So, if you wish to play EuroMillions with the DoubleJackpot feature you’ll pay €5.90, instead of €2.95. The EuroMillions draw takes place every Tuesday and Friday night in Paris at approximately 21:00 CET. Go the EuroMillions playslip and for each line simply tick the Magic Million box after you’ve picked your numbers and, once you’ve paid, your Magic Million game will begin automatically. Magic Millions has a top prize of €1,000,000, and other prizes ranging from €0.25 all the way up to €100k! Subscriptions remove the hassle of buying repeat lines and the fear of missing out on that big jackpot win. 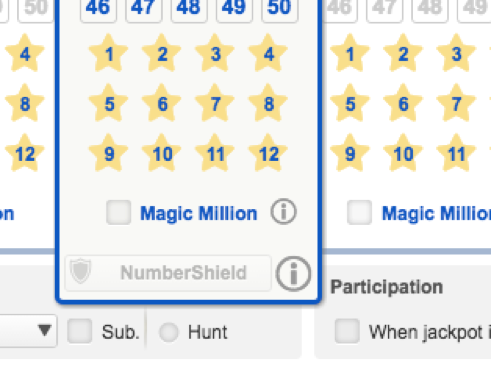 Our Subscription feature allows you to set up a running ticket or tickets on a given lottery draw. The subscription is open ended and will run for as long as you want it too. You can opt out at any time. The EuroMillions is Europe's most popular draw and you can play with us and win all the same main game prizes with us. In addition to this, you can take advantage of a range of exclusive features such as DoubleJackpot, Subscriptions and JackpotHunt that you won't find anywhere else. If you're a new customer, we'll also give you your first line free.